A popular flooring option for many homeowners is wall-to-wall carpet. However, day-to-day foot traffic and accidental spills can quickly make it look dingy. Knowing how to clean your carpet correctly can help it look like new and last longer. The first step to routine maintenance is vacuuming on a regular basis to remove dirt and debris. You will have to include spot removal with your regular maintenance if you want to keep your carpet looking clean. There is always a DIY carpet cleaning solution to help make your carpet last longer and look cleaner. Stains and dirt are an inevitable aspect of having carpet in your home. From spilled juice to dog vomit to the heavy everyday traffic, your carpet takes a beating. To clean your carpet, you can use a commercial carpet cleaning product that may contain harsh chemicals, or you can choose to create a homemade DIY solution. Stop spending your hard-earned money trying to keep your carpet spotless. You don’t have to waste your money on those expensive commercial cleaning products, and you don’t have to hire a professional carpet cleaner to get your carpet looking like new. Several recipes use inexpensive ingredients that will tackle tough, ground-in dirt and stains just as well, if not better than the products you can buy in the store. 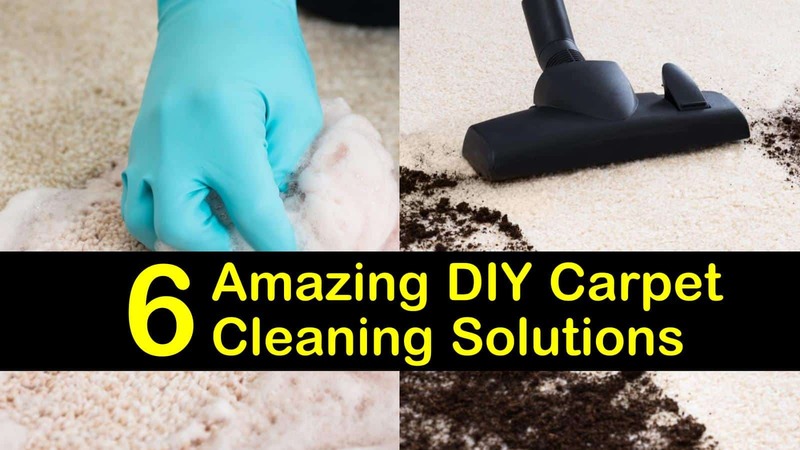 Since commercial cleaning products are often costly, creating a homemade carpet cleaner using inexpensive everyday products is a great alternative. Not only will you save money by making a homemade carpet cleaning solution, but you’ll keep your family safe from harsh toxic residue that many store-bought products leave behind. To get a powerful carpet shampoo mix the ammonia, dish soap, and water until combined. You can add essential oils to the solution if you’d like to leave your carpets smelling fresh after you’ve completed the cleaning. Slowly stir the solution to ensure that all the ingredients are mixed thoroughly. Follow the manufacturer’s instructions to operate the machine and clean your carpets. If you have pets and areas that see heavy traffic, your carpets can start to smell rancid after a while. This recipe does an excellent job cleaning even the toughest dirt and carpet stains while deodorizing the entire area. The vinegar is an acetic acid that will kill germs and loosen and lift dirt from your carpet. Add the hot water to the tank of your carpet cleaning machine. Slowly add the vinegar and Oxyclean to the water. Stir the contents of the container to dissolve the Oxyclean completely. Clean your carpets according to your machine’s manufacturer’s directions. You don’t have to spend a lot of money to get your carpets clean. Along with being reasonably expensive, commercial cleaning products often contain harsh chemicals that can be toxic to your family and the environment. 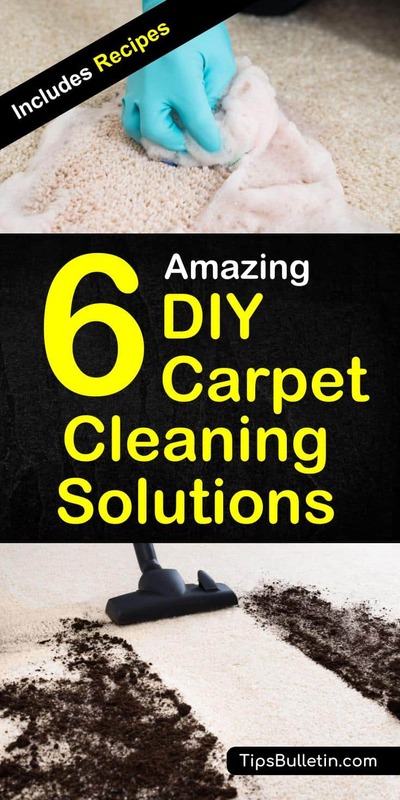 The homemade carpet cleaning solution is great to use in your steam cleaner, Bissel, Rug Doctor or Kirby machine and works just as well as the products you can buy at the store. Fill the tank of your carpet steam cleaner with the hot water. Add the dish soap, hydrogen peroxide, and vinegar. Finally, add in the lemon essential oil. Stir the ingredients slowly to ensure they are thoroughly mixed. Follow the manufacturer’s instructions on your machine and clean your carpets. Dealing with stains in your carpet can be tricky. From spilled food and drinks to pet stains, finding the best solution to eradicate them can be frustrating. Using ammonia on carpet stains is an excellent DIY carpet stain remover for lifting dirt and stains from your carpet. Ammonia is inexpensive and will clean, deodorize, and neutralize any unpleasant smell you may be dealing with. Mix the water and ammonia together in a medium-sized bowl. Pour the mixture over the stain and cover it with a clean, white towel. Place a warm iron on top of the cloth. The combination of the heat and the ammonia will lift even blood stains from the carpet fibers. No matter how well trained your four-legged friends are, accidents are inevitable. To keep the urine from setting into the carpet fibers, it’s best to clean up the accident before it has a chance to dry. The vinegar and baking soda in this recipe work together to break down the crystals in the urine and absorb the odors associated with pet urine. In a large bowl mix the ingredients, stirring to ensure the baking soda is dissolved and the elements are well combined. Pour the solution into a spray bottle and spray the soiled area. Let the solution sit for at least ten minutes. Using a soft cloth, blot the area to pull up any excess liquid. The combination of white vinegar and baking soda is often used in other powerful natural cleaner recipes such as for homemade bathroom cleaner or floor cleaners. For heavier pet stains, sprinkle the baking soda directly onto the stain. Next, pour the mixture of two cups vinegar and two cups water directly over the soda and let sit for five minutes. Use a clean, soft cloth to blot the area. If your home smells anything less than inviting, it could be because of the odors that have become trapped in your carpet. Every house has a natural odor footprint based on what’s inside. It could be from the ingredients you use to cook with; it could be from your pets, or even from the harsh chemical cleaners that you usually use. In any case, this easy DIY carpet deodorizer will have your carpet, and your house smelling fresh again. Grind the dried lavender in a blender or old coffee grinder and place in a glass container. Add the baking soda and essential oil. Place the lid back on the jar and shake well to combine. Let the jar sit overnight to allow the essential oils to permeate the baking soda. Sprinkle over the carpet and allow to rest for 15 minutes and then vacuum as usual. Keeping your carpets looking like new and smelling fresh doesn’t have to result in draining your wallet. Most commercial carpet cleaners are expensive, not to mention they contain harsh chemicals. Save yourself some money and make a DIY carpet cleaning solution that will clean your carpets and keep your family safe. We hope you enjoyed the article and gained some new information that you can incorporate into your own life. If you like what you read, please feel free to share it with your friends and family.